No, we aren’t moving. We have been in our community for over 15 years, and we love it. Yet, at several points during our life together, my husband and I moved almost every six months. Thirteen places in our first ten years together! We loved the thrill of new places; meeting new people, discovering new places and experiencing new adventures. We pulled our little trailer with our soft top GMC Tracker, as we moved from place to place across Canada. We traded our beloved trailer for backpacks, when we decided to cross the Atlantic Ocean and explore The United Kingdom. Did the excitement of moving help me attain personal happiness in each new location? Sadly, no. Looking back, I remember times of pure joy, and times of utter despair. It wasn’t until a few years ago that I could even acknowledge the fact that I suffered from mental illness, so at the time I couldn’t understand why couldn’t I be happy. We lived for a time in the world famous mountain town of Banff, Alberta, in the middle of the Canadian Rocky Mountains. Have you been there? If not, you really should go. It is truly one of God’s masterpieces. So, there we were, living in a resort town, in a brand new beautifully furnished third floor apartment. I was working for the tourism bureau and a ski organization and Kevin was employed by an electrical company. Every weekend was a new adventure. Through working at the tourism bureau, I learned about the best places to explore. We found new friends who became like family. Yet, I had a secret. I was sad. 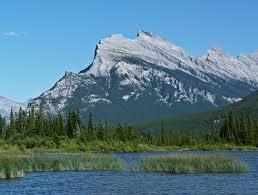 Every morning I’d wake up to a spectacular view of Mount Rundle from our apartment window. Know that mountain? It’s spectacular. How could I not be happy living and working in a place like this?? Easy…moving physical locations doesn’t heal the hurt or loneliness inside of each of us. Our internal condition follows us wherever we go and it determines our outlook, positively or negatively. We need to experience internal healing. Only God can fill that void with His love. God never leaves us, no matter where we are in this world. Have you tried to heal yourself through moving, buying “stuff” or making changes in your life on the outside? I also moved 13 times in 10 years. Each time I moved, I thought it would be a fresh start. Each time, I was wrong because I brought myself and all my problems with me. Thankfully, at some point I started getting to the bottom of some of those long standing issues. What helped me most was getting into small groups. Going to church was something I had always done (I gave my heart to the Lord as a child) but it’s easy to be inauthentic in church. I was challenged in small group settings to be real and find God in new and exciting ways. That journey hasn’t stopped. There are still issues. Thankfully, there is still God too, patiently waiting to help me work through them. Surrounding ourselves with community is definitely important. And our lives are a continuous journey, aren’t they? Next PostNext Our Family Spent 24 Hours Electronic Free. Yes! !